by von Sivers, Peter; Desnoyers, Charles A.; Stow, George B. 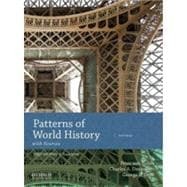 Patterns of World History, Third Edition, offers a distinct framework for understanding the global past through the study of origins, interactions, and adaptations. Authors Peter von Sivers, Charles A. Desnoyers, and George B. Stow examine the full range of human ingenuity over time and space in a comprehensive, evenhanded, and critical fashion. The authors offer a distinct intellectual framework for the role of innovation and historical change through patterns of origins, interactions, and adaptations. Each small or large technical or cultural innovation originated in one geographical center or independently in several different centers. As people in the centers interacted with their neighbors, the neighbors adapted to--and in many cases were transformed by--the innovations. By "adaptation" the authors include the entire spectrum of human responses, ranging from outright rejection to creative borrowing and, at times, forced acceptance. Seeing patterns of various kinds in historical development brings to light connections and linkages among peoples, cultures, and regions that might not otherwise present themselves. Such patterns can also reveal differences among cultures that other approaches to world history tend to neglect. For example, the differences between the civilizations of the Eastern and Western Hemispheres are generally highlighted in world history texts, but the broad commonalities of human groups creating agriculturally-based cities and states in widely separated areas also show deep parallels in their patterns of origins, interactions, and adaptations. Such comparisons are at the center of Patterns of World History. This kind of analysis offers insights into how an individual innovation was subsequently developed and diffused across time and space--that is, the patterns by which the new eventually becomes a necessity in daily lives. Through all of this we gain a deeper appreciation of the unfolding of global history from its origins in small, isolated areas to the vast networks of global interconnectedness in our present world. The authors' use of a broad-based understanding of continuity, change, and innovation allows them to restore culture in all its individual and institutionalized aspects--spiritual, artistic, intellectual, scientific--to its rightful place alongside technology, environment, politics, and socioeconomic conditions. Understanding innovation in this way allows this text to help illuminate the full range of human ingenuity over time and space in a comprehensive, evenhanded, and open-ended fashion. George B. Stow is Professor of History and Director of the Graduate Program in History at La Salle University. 15.5--Garcilaso de la Vega, "The Walls and Gates of Cuzco"
16.2--Thomas the Eparch and Joshua Diplovatatzes, "The Fall of Constantinople"
16.3--Evliya Çelebi, "A Procession of Artisans at Istanbul"
16.4--Ogier Ghiselin de Busbecq, "The Court of Suleiman the Magnificent"
17.3--Duc de Saint-Simon, "The Daily Habits of Louis XIV at Versailles"
21.5--Honda Toshiaki, "Secret Plan for Managing the Country"
23.2--Simón Bolívar, "The Jamaica Letter"
25.5--Nikolai Chernyshevsky, What Is to Be Done? 26.4--Karl Marx, "Wage Labour and Capital"
27.4--Rudyard Kipling, "The White Man's Burden"
27.5--Mark Twain, "To the Person Sitting in Darkness"
28.3--Benito Mussolini and Giovanni Gentile, "Foundations and Doctrine of Fascism"
29.4--Ho Chi Minh, "The Path Which Led Me to Leninism"
29.5--Indira Gandhi, "What Educated Women Can Do"
30.2--Martin Luther King, Jr., "I Have a Dream"
30.5--Salvador Allende, "Last Words to the Nation"
31.1--Osama bin Laden, "Declaration of War against the Americans Occupying the Land of the Two Holy Places"
31.4--Arundhati Roy, "Capitalism: A Ghost Story"